The hard drive already has some files. 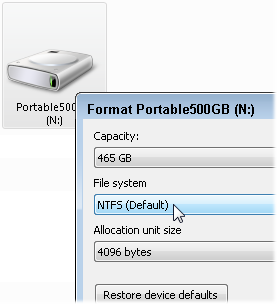 How do I format the drive to NTFS? A: Creating a System Image on a portable drive is the best way to back up your Windows 7 computer. Before a hard drive can be used, though, it must be formatted, which is how computers prepare drives for incoming files. 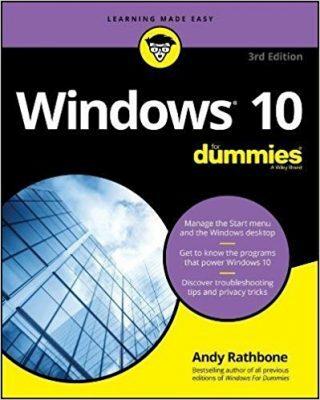 Windows can format hard drives in several different ways, but System Images are picky: You can only store System Images on drives formatted with NTFS (New Technology File System). Formatting a drive completely erases its contents, so you need to store your drive’s current files in a safe place. You can copy the drive’s files back to your computer, for example, to a flash drive, or burn them to a CD or DVD. Plug the external hard drive into your computer. Click the Start menu, and choose Computer. Right-click your drive’s icon and choose Format from the pop-up menu. When the Format window appears, be sure to choose NTFS from the File System menu. Windows formats your drive using NTFS, making it acceptable for storing System Images. After formatting your drive, copy its original files back onto the drive. Alternatively, you can trust Windows to convert your drive to NTFS, leaving the existing files intact. However, if something goes wrong during the conversion process, you’ll lose your files. It’s safer to backup your files, format the empty drive to NTFS, and copy the files back to the drive.